IN-DEPTH LOOK: WWE ‘Sting: Into The Light’ Documentary – DVD & Blu-Ray Out Tomorrow! I recall just over a year ago there was a degree of outrage when you guys and girls had it confirmed that the “Best of Sting” WWE DVD wouldn’t feature a documentary, but rather a simple match compilation. Fast forward and in just a matter of hours we will have the long anticipated Sting WWE documentary – “Sting: Into The Light”! Today, I am going to run through the documentary portion of the set, as well as giving my thoughts on it and how well it was executed. The main feature on “Into The Light” runs for just under 1 hour and 19 minutes and is formatted like one of the newer “Network era” documentaries, rather than the classic career-spanning documentary features which we were accustomed to on DVD. It mixes together three main aspects: career documentary, present day reflection (on matches and his career at large) and of course Sting’s visit to WWE HQ and his interactions backstage at a selection of WWE events. “Into The Light” opens with the Stinger arriving at WWE Headquarters in Stamford, Connecticut – this portion of the documentary is very similar to the opening of “Warrior: Ultimate Legend”. After some initial scenes of Sting at WWE HQ we move to Sting’s home where he’s getting set to re-watch the famous Clash of the Champions bout with Ric Flair, and of course he is watching via “the award winning WWE Network” — the first time we’ve seen someone watching the WWE Network on a DVD project. These segments are scattered throughout the documentary and jump between Sting watching and reflecting on the matches and his memories of it, as well as various pertinent talking heads discussing those matches. Throughout the documentary a number of matches are given this treatment including: Great American Bash 1990 (vs. Ric Flair for the NWA World Heavyweight Championship), Starrcade 1997 (vs. Hollywood Hulk Hogan for the WCW World Heavyweight Championship) and his match with Ric Flair on the very last WCW Nitro in March 2001. 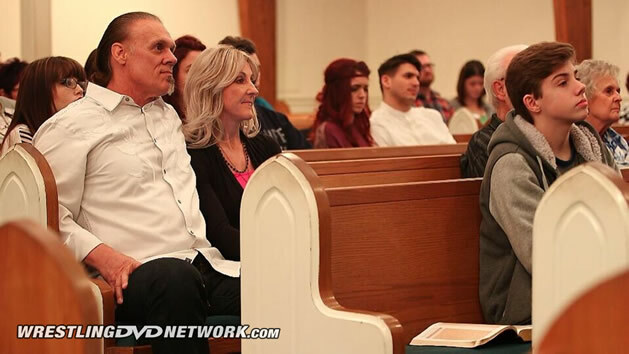 The documentary then moves on to follow Sting to his parents’ house, here we are given Sting’s history from childhood, all the way up to his exploits in Memphis with Jerry Jarrett, his tenure with the Mid-South Wrestling/UWF promotions and then his eventual transition into World Championship Wrestling. Here we have clips and discussion from The Ultimate Warrior (from his “Ultimate Collection” DVD), Jerry Jarrett, Jim Ross, Rick Steiner, Lex Luger, Ric Flair and Sting’s parents. From here the documentary moves back to discuss the Great American Bash 1990 – here the transition into discussion of the match was much smoother than the Clash of the Champions match. This one fits in exactly with the story as it was being told. After talking about the NWA Title Match at the Great American Bash we return to WWE HQ where Sting meets with a number of individuals from WWE’s consumer products department, then we follow Sting to his barn. In here he keeps much of his wrestling memorabilia from over the years; everything from this neon tights and sparkly jackets to his crow era boots and singlets, in addition to lots of other toys, posters and various products featuring his likeness. The next major topics for discussion are Sting’s loyalty to WCW and the reason why he never made it to WWE back in the day, along with discussion of his transition from “surfer” Sting into “the crow” and the build to Starrcade 1997 and of course the match itself. 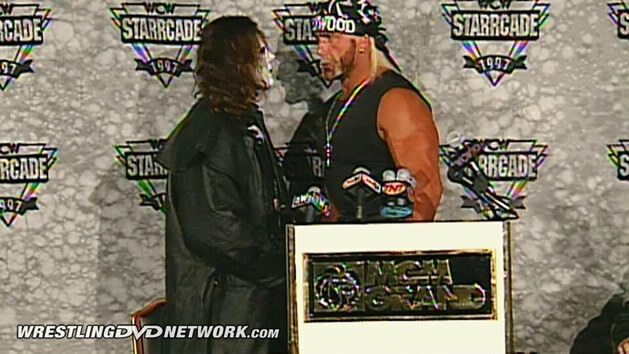 During the Starrcade segment the discussion comes from Sting, Hulk Hogan and Eric Bischoff as they talk about the circumstances regarding the final outcome of the match and the politics in play at the time (with both Sting and Bischoff pointing the finger squarely towards the Hulkster) and how the finish left a bad taste, maybe even staining the incredible near 18 month build up. Back at WWE HQ and Sting goes off to visit with WWE’s Community Relations department to discuss their work with charity and within communities, which then segues into discussion of Sting’s philanthropy and religious beliefs as we see Sting attending church, discussing the breakdown of his first marriage, and his new fiancée; who he would marry shortly after WrestleMania. Next up we have reached 2001 and as WCW comes to end we have Sting vs. Ric Flair one last time, as we hear Sting’s hesitations about joining WWE in that era. The next visit in WWE HQ involves the digital media and website folks. They and Sting discuss his appearance at ComicCon and the awesome WWE 2K15 trailer. The next segment sees the Stinger hitting the gym and discussing his wishes to have a “WrestleMania Moment”. In this portion we also have a brief mention of TNA and his tenure which started from being one last match to what wound up being a seven year run (we even have a few still photographs shown on screen of Sting in TNA). The final WWE HQ segment involves Sting meeting with Triple H and even a clandestine meeting with Vince McMahon. Sadly, the cameras are shunned from these meetings, after which Sting leaves the building and is seen driving off (but the meeting went well… we think). Three months later and we pick up the story at the 2014 Survivor Series with secret footage of Sting arriving at the arena, before being ushered on to a bus by Mark Carano. Here we see Sting preparing and applying his face paint before heading to the curtain for his long awaited WWE debut. For his actual appearance we are treated to a selection of alternative camera angles, as WWE utilized footage filmed by various fans in the crowd of The Stinger first appearing and heading towards the ring. This is the type of footage that if you don’t have goose bumps while watching; maybe you aren’t a wrestling fan (in fact Triple H pretty much says the exact same thing)! Fast forward again and we move to January 2015 where we have footage of Sting signing his very first WWE contract. Sting goes into detail about the long process which it was for him to actually put pen to paper and recalls his many discussions with Triple H, which originally began way back in December 2013. This means that all the prior appearances which Sting took part in were all without ever signing a full time deal with the company! WrestleMania is of course the next major segment of the documentary; it begins with footage of Sting leaving the hotel and beginning the journey toward Levi’s Stadium. Sting discusses his emotions and being inside the stadium and a WWE ring. Here we also have clips of fans talking about their anticipation for the match and finally getting to see Sting wrestle inside a WWE ring. Of course footage of the match is shown, including the DX and nWo run-ins (where Hulk Hogan remains intact, in fact there are no edits of any Hogan related content; either interview or archive footage, however, could this be the final WWE Home Video project to feature the Hulkster)? Post-match, the cameras follow Sting backstage where he meets with Arnold Schwarzenegger. In the early part of the documentary Sting talks about Arnold as being an inspiration which got him into bodybuilding, which in turn lead to wrestling; and after what Sting considered his final wrestling match (at the time) meeting Arnold was a really cool bookend. While the documentary was an enjoyable watch, I’m not 100% sure that it was the Sting documentary which I’ve wanted to see for so, so many years now. It has a number of similarities with the “Ultimate Legend” documentary which, considering the link between Sting and Warrior, was actually kind of cool. Another really neat thing about the documentary was just how much footage they filmed with Sting to make the DVD and how it was spread over a period of nearly a year! They capture a number of very different and unique moments. Personally I would have preferred if Sting’s career had been covered in more detail. However, on the whole the mammoth amount of “present day” footage and “documentary” aspects merged together really well. The only real exception was the first Clash of the Champions match, which for some reason featured twice during different points of the documentary; this was a little odd. 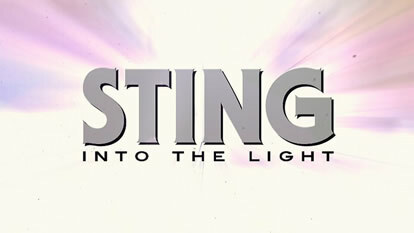 On the whole, “Sting: Into The Light” was an enjoyable watch and I am sure that you’ll be of the same opinion. So, this means I don’t have any reservations giving the new DVD and Blu-ray a big thumbs up – my recommendation is that you head out for a copy when it drops tomorrow! – Australia: Out now! Get hold of your DVD or Blu-ray via WWEDVD.com.au. – USA: Out tomorrow! Order a copy here on Amazon.com or via WWEShop.com. – UK/Europe: Out next week! Pre-order your DVD or Blu-ray from Amazon.co.uk. Has anyone watched this on the Network? It’s about 20 minutes shorter (with a lot of the personal life stuff cut out, and everything between the end of WCW and his WWE run gone) than the DVD/Blu Ray release, and the order of the cut is changed. (For example, Sting in the gym talking about his WrestleMania moment is now AFTER the WWE HQ/Vince stuff.) Have they cut up/altered any other home release for the Network like this. Just finished watching this set and have a few pet peeves. I enjoyed the documentary for what it was, but agree that it was lacking depth. My main issue is the usual edits WWE make in the matches part of these sets. The 89-92 Sting theme is edited out. I always hate theme edits, but especially this one as the theme was intact on last years Best of Sting. It was nice to see Rick Rude’s WCW 91-92 theme appear though as that one is edited even on the network although it was probably an oversight. I really dislike when Jesse Ventura’s commentary is edited out, but they even edited out Jim Ross from the match with Rude. Without the commentary there is no explanation as to why the judges are at ringside and the pressing time limit on the semi final match. They really should have kept Ross’ commentary intact to help this process. On the whole though, a decent release. I’m tired of these WWE Network era style documentary. This guy has a 30 year career and covering it all in just a little over 1 hour just doesn’t do it justice. WWE has to go back to and do the proper career documentaries in its proper order and form and not keep insulting the fan’s intelligence by taking short cuts on everything. Sting: Into the Light – Hatchet job with the documentary which also took short cuts when it came to the match selections. Glad I’m not buying either of these sets. Rather just download the documentary and save my money. That sums up how I feel this doc would end up. I haven’t seen it yet, but will. To me it’s like this is a perfect WWE Network doc, a Sting Documentary Special for The Network. But disc docs should be the usual career retrospective that we’ve come to know and love. There is an Easter Egg on the chapter “Signed”. Click right twice and you get a little comical Easter egg of Sting at home.